With these cool fall days and the holidays just around the corner, we’re dreaming of sweaters, scarves, warm drinks and, you guessed it, Christmas! We may already have a few little trees and Christmas decorations set out around the studio…! So, what better time than now to put together a cozy winter boudoir set! These mini sessions will be on Friday, December 1st at the studio, and all images will be delivered Monday, December 4th to give you plenty of time to put together the perfect gift! Click the Schedule Your Session button below to book! One of the most common questions we get asked for boudoir sessions is “What do I wear? !” For this winter set, we love the idea of pairing a soft, cozy oversized sweater or cardigan with some lacy pieces underneath, and even throwing on some thigh-high socks or legwarmers. Muted, neutral colors or adding in a pop of deep red or dark green would be the perfect touch for this set. This will be the perfect gift for your significant other, your fiance, your spouse, or even just for YOU! 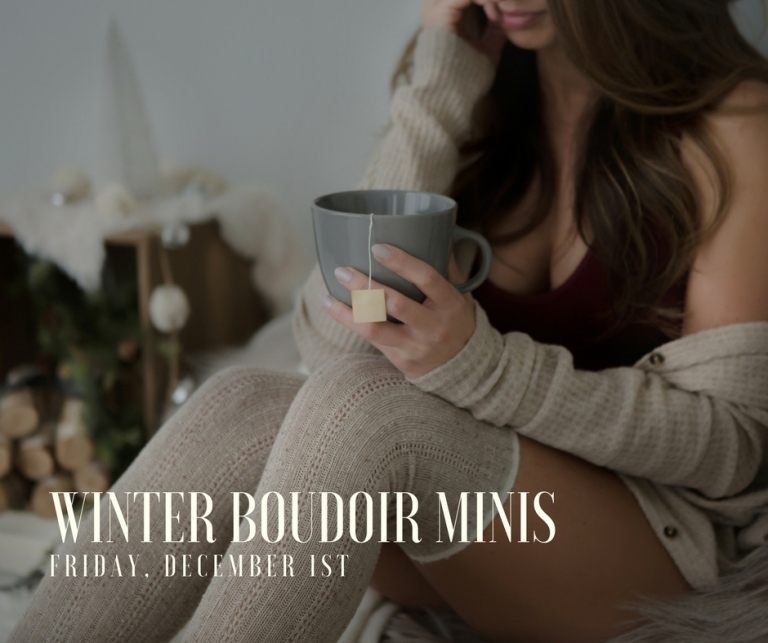 Book your winter boudoir mini session today by clicking the Schedule Your Session button at the top of the post! Session fee is $350 and includes 15 high resolution digital images in an online password-protected gallery.